Halloween is the most haunting holiday of the year. It captivates hundreds of thousands of people ranging from children to grandparents who love telling old ghost stories. Whether you plan on turning your home into a haunted house or just want to add some decorations to the front porch, these Halloween Tissue Decorations will add to your decor. They vary in traditional shapes such as tissue balls, garland, and festooning, but also include tissue pumpkins, spiders, and ghosts. 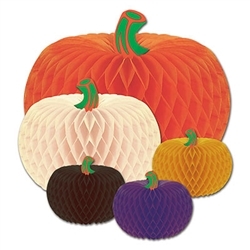 These decorations are perfect for trick-or-treat night or even for a classroom or office space. Decorate your tableware so it is appropriate for Halloween and Fall. Place an Art-Tissue Pumpkin as a centerpiece for your tables. Decorate for Halloween by hanging the Hanging Ghost in a room or use it for a Haunted House. No matter what Halloween tissue decoration you use it will add a fun unique touch to your festive decorations. Looking for ideas on how to start decorating for Halloween this year? Keep things simple and classic by decorating with Halloween Tissue Decorations. 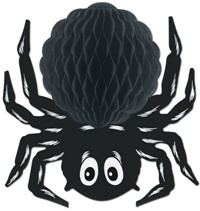 You can choose from Tissue Pumpkins, Tissue Ghosts, Tissue Spiders and traditional Orange and Black Pageant Garland. To start, hang the garland on banisters and even drape it across the ceiling. Place the pumpkins on the floor or on a table in clusters, which makes a great substitution for real pumpkins because this way you won't have to worry about the cost and maintenance when pumpkins rot. Hang the ghosts from different heights on a porch or inside a venue. Then, place a large Tissue Spider or two on a large Spider Web in the corner or a room. Top off your decorating by placing Tissue Candles in every window sill so that you don't have to worry about anything catching on fire. The best part about tissue decorations is that you can fold them up and store them until next year! Make sure to take a look at all of the Halloween Decorations we offer to find everything you need for an spook-tacular holiday. We offer everything from these tissue decorations and garlands to cutouts and door decorations. But not only should you decorate for Halloween, but you also need to dress up so take a look at the Halloween Costumes and Accessories we have so you can have the best outfit amongst all of your friends and family.